Accommodation in Tajikistan’s best lodgings. Domestic flight Osh-Bishkek, on a safe international airline. All meals according to programme: 8 breakfasts, 7 lunches, 8 dinners in carefully selected places. Bottled water, refreshments and sweet treats while on the road and while exploring sights. A comprehensive information pack with maps, literature, useful knowledge and gifts. Tips for pretty much everyone but guide and driver. Day 1, Tuesday, September 25, 2018: Arrive in Dushanbe, Tajikistan’s green, peaceful and traffic-free capital. Some time to rest, and perhaps enjoy the hotel’s spa and swimming pool. A welcome afternoon walk in Dushanbe, followed by dinner in a curious Afghan restaurant in town. Overnight in Dushanbe, Serena, two nights. Dinner. Day 2, Wednesday, September 26, 2018: After a late breakfast, we will have a half day tour of Dushanbe: Rudaki avenue, the museum of national antiquities, and the small and unusual museum of Gurminj Zavkibekov, a Tajik artist and musician. The ‘museum’, more like his former home, is constantly full of young local musicians looking for a venue to practice, and has more than one hundred traditional Badakhshani and Tajik instruments. Let’s share our lunch here, and have some fun with music! Afternoon at your leisure. There is much to explore in this quiet green town (before development has arrived here, too), or enjoy the hotel’s pool. Dinner in town: in a fine Ukrainian restaurant. Overnight in Dushanbe, Serena, second night. Breakfast, lunch, dinner. Day 3, Thursday, September 27, 2018: After breakfast we will start driving on the M41, known as the Pamir Highway, the world’s second highest paved road. The first stretch of road will see us drive across Khatlon, an agricultural, fertile land, until we eventually reach the Pyanj river, which is the border between Tajikistan and Afghanistan. The road (recently paved) will turn very dramatic, twisting and curving along the river, sheer cliffs on one side, sheer drops on the other. Welcome to Pamir and the Autonomous Region of Gorno-Badakhshan! We will stop for a picnic lunch on the way, before reaching Kalaikhum, exactly half way to Khorog, where we will stay in a newly built plush hotel. Late afternoon at your leisure to rest, have a walk in Kalaikhum village, or join Yuri for a walk to the nearby ruined fortress of Karon. Dinner at our hotel. Overnight in Kalaikhum, Karon Palace, one night. Breakfast, lunch, dinner. Day 4, Friday, September 28, 2018: Today we will drive on the bumpiest stretch of the Pamir High- way, along the Pyanj river. Be prepared for bumpy roads, but also be prepared to be overwhelmed by the mountains surrounding us on all sides. We will pass many small villages tucked in the narrow valleys underneath. We will have a chance to see life on the Afghan side, just across the river. Please notice the changes: the Tajik side, which we are driving on, has infrastructure (although crumbling) like schools, roads and electricity. The Afghan side has only started building a narrow road and schools. We will enjoy a simple village lunch on the way, with a local Pamiri family who at this moment will be busying themselves drying and conserving their own produce for winter: apricots, figs, apples, pears, and many vegetables. In the late afternoon we will arrive at Khorog, the capital of Gorno-Badakhshan Autonomous Region of Tajikistan. It is a very welcoming small university town. We will stay at the Serena Inn, owned by the Aga Khan, spiritual leader of the Ismaili Muslims. Dinner at the hotel restaurant, on the bank of the Pyanj river. Day 5, Saturday, September 29, 2018: After breakfast we will continue to Ishkashim and the Wakhan valley, where once British, Russian and Chinese empires met. We will visit the Afghan border market at Ishkashim village. This market takes place only once a week, and is a chance to people from both sides of the border to meet and exchange their local products. It takes place in no-mans-land, on an island inside the river. Be prepared to notice the change in attire and manners. Be ready to find some unique products, and to bargain! They haven’t seen many foreigners here. In the afternoon we will visit a nearby mazar (an Ismaili shrine), an ancient ruined fortress and a Zoroastrian temple. Lunch with a local Wakhi home. 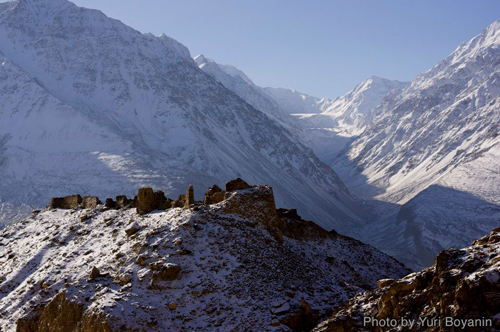 The Wakhi have some of the world’s most beautiful and intricately carved homes. We will learn more about the symbolism of it, and also more about life in a border area that has been troubled for decades. On the way back we will stop at the family home of traditional folk healers. Let’s learn more about their art of medicine. We will be back in Khorog in time for dinner at our hotel. Overnight in Khorog, Serena, second night. Breakfast, lunch, dinner. Day 6, Sunday, September 30, 2018: After a late breakfast, we will take a walk in town, visiting the brand new University of Central Asia campus, and the beautiful Botanical gardens - the highest in the world. Free time to explore the town on your own in the afternoon. Overnight in Khorog, Serena, third night. Breakfast, lunch, dinner. Day 7, Monday, October 1, 2018: Today we will drive to Osh. Due to the risk of altitude sickness, we will not stay overnight in the town of Murghab, like all other (adventurous) groups are doing. It will be a long drive, quite bumpy at times, but the scenery will be second to none, and the last stretch of road in Kyrgyzstan has recently been paved. Our first drive will be across numerous villages and farmland. As we go further up the mountains, all Pamiri and Wakhi settlements disappear, and so do trees. 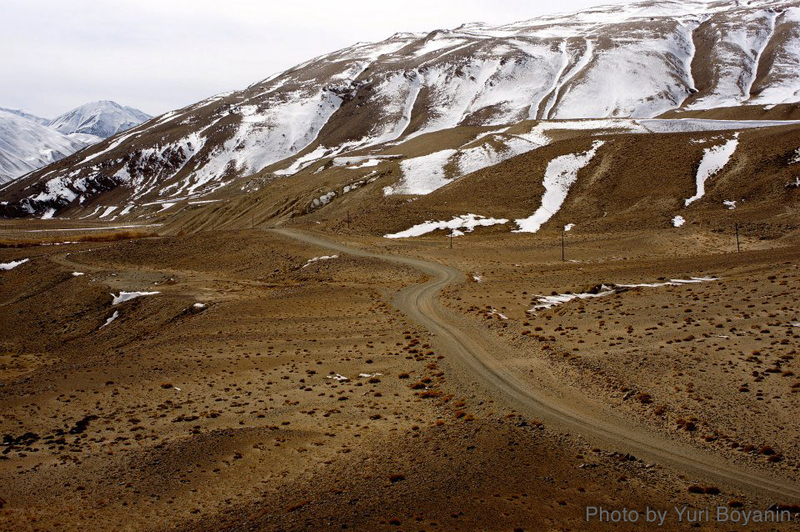 We will enter the barren Murghab plateau, where only a band of hardy Kyrgyz shepherds live. We will stop for a short walk in Murghab town to have a look at the market, and also at some absolutely beautiful traditional crafts - especially the woolen socks the ladies of the town make! Picnic lunch on the way. Then we continue across the Ak Baital pass (at 15,272 feet) and across the Kyrgyz-Tajik border at the Kyzyl Art Pass (14,042 feet). Welcome to Kyrgyzstan! The road will dramatically improve as we head down to the Ferghana valley to the town of Osh. Day 8, Tuesday, October 2, 2018: In the morning, after a late breakfast, join us for a tour of Osh old town, including the UNESCO-inscribed Suleiman Too mountain, and the market. Traditional lunch in a local Uzbek restaurant. In the afternoon we will catch a short flight to Bishkek. Transfer to our hotel, the Hyatt, and farewell dinner in a fine restaurant nearby. Day 9, Wednesday, October 3, 2018: Breakfast, and transfer to Bishkek airport for your flights back or where the heart takes you next. Day 1, Tuesday, August 27, 2019: Arrive in Dushanbe, Tajikistan’s green, peaceful and traffic-free capital. Some time to rest, and perhaps enjoy the hotel’s spa and swimming pool. A welcome afternoon walk in Dushanbe, followed by dinner in a curious Afghan restaurant in town. Day 2, Wednesday, August 28, 2019: After a late breakfast, we will have a half day tour of Dushanbe: Rudaki avenue, the museum of national antiquities, and the small and unusual museum of Gurminj Zavkibekov, a Tajik artist and musician. The ‘museum’, more like his former home, is constantly full of young local musicians looking for a venue to practice, and has more than one hundred traditional Badakhshani and Tajik instruments. Let’s share our lunch here, and have some fun with music! Afternoon at your leisure. There is much to explore in this quiet green town (before development has arrived here, too), or enjoy the hotel’s pool. Dinner in town: in a fine Ukrainian restaurant. Day 3, Thursday, August 29, 2019: After breakfast we will start driving on the M41, known as the Pamir Highway, the world’s second highest paved road. The first stretch of road will see us drive across Khatlon, an agricultural, fertile land, until we eventually reach the Pyanj river, which is the border between Tajikistan and Afghanistan. The road (recently paved) will turn very dramatic, twisting and curving along the river, sheer cliffs on one side, sheer drops on the other. Welcome to Pamir and the Autonomous Region of Gorno-Badakhshan! We will stop for a picnic lunch on the way, before reaching Kalaikhum, exactly half way to Khorog, where we will stay in a newly built plush hotel. Late afternoon at your leisure to rest, have a walk in Kalaikhum village, or join Yuri for a walk to the nearby ruined fortress of Karon. Dinner at our hotel. Day 4, Friday, August 30, 2019: Today we will drive on the bumpiest stretch of the Pamir High- way, along the Pyanj river. Be prepared for bumpy roads, but also be prepared to be overwhelmed by the mountains surrounding us on all sides. We will pass many small villages tucked in the narrow valleys underneath. We will have a chance to see life on the Afghan side, just across the river. Please notice the changes: the Tajik side, which we are driving on, has infrastructure (although crumbling) like schools, roads and electricity. The Afghan side has only started building a narrow road and schools. We will enjoy a simple village lunch on the way, with a local Pamiri family who at this moment will be busying themselves drying and conserving their own produce for winter: apricots, figs, apples, pears, and many vegetables. In the late afternoon we will arrive at Khorog, the capital of Gorno-Badakhshan Autonomous Region of Tajikistan. It is a very welcoming small university town. We will stay at the Serena Inn, owned by the Aga Khan, spiritual leader of the Ismaili Muslims. Dinner at the hotel restaurant, on the bank of the Pyanj river. Day 5, Saturday, August 31, 2019: After breakfast we will continue to Ishkashim and the Wakhan valley, where once British, Russian and Chinese empires met. We will visit the Afghan border market at Ishkashim village. This market takes place only once a week, and is a chance to people from both sides of the border to meet and exchange their local products. It takes place in no-mans-land, on an island inside the river. Be prepared to notice the change in attire and manners. Be ready to find some unique products, and to bargain! They haven’t seen many foreigners here. In the afternoon we will visit a nearby mazar (an Ismaili shrine), an ancient ruined fortress and a Zoroastrian temple. Lunch with a local Wakhi home. The Wakhi have some of the world’s most beautiful and intricately carved homes. We will learn more about the symbolism of it, and also more about life in a border area that has been troubled for decades. On the way back we will stop at the family home of traditional folk healers. Let’s learn more about their art of medicine. We will be back in Khorog in time for dinner at our hotel. Day 6, Sunday, September 1, 2019: After a late breakfast, we will take a walk in town, visiting the brand new University of Central Asia campus, and the beautiful Botanical gardens - the highest in the world. Free time to explore the town on your own in the afternoon. Day 7, Monday, September 2, 2019: Today we will drive to Osh. Due to the risk of altitude sickness, we will not stay overnight in the town of Murghab, like all other (adventurous) groups are doing. It will be a long drive, quite bumpy at times, but the scenery will be second to none, and the last stretch of road in Kyrgyzstan has recently been paved. Our first drive will be across numerous villages and farmland. As we go further up the mountains, all Pamiri and Wakhi settlements disappear, and so do trees. We will enter the barren Murghab plateau, where only a band of hardy Kyrgyz shepherds live. We will stop for a short walk in Murghab town to have a look at the market, and also at some absolutely beautiful traditional crafts - especially the woolen socks the ladies of the town make! Picnic lunch on the way. Then we continue across the Ak Baital pass (at 15,272 feet) and across the Kyrgyz-Tajik border at the Kyzyl Art Pass (14,042 feet). Welcome to Kyrgyzstan! The road will dramatically improve as we head down to the Ferghana valley to the town of Osh. Day 8, Tuesday, September 3, 2019: In the morning, after a late breakfast, join us for a tour of Osh old town, including the UNESCO-inscribed Suleiman Too mountain, and the market. Traditional lunch in a local Uzbek restaurant. In the afternoon we will catch a short flight to Bishkek. Transfer to our hotel, the Hyatt, and farewell dinner in a fine restaurant nearby. Day 9, Wednesday, September 4, 2019: Breakfast, and transfer to Bishkek airport for your flights back or where the heart takes you next.